Beatles or Stones? Clash or Pistols? Blur or Oasis? Frequently, English pop music, helped by its influent musical press, brings two of its most famous specimens into conflict more or less artificially: ideal sons-in-law versus naughty boys, melodies versus anger, political commitment versus nihilism, sophistication versus authenticity... Meanwhile, outside the ring, other bands, sometimes less famous outside Great Britain, draw a very realistic portrait of their native island: Ray Davies' Kinks in the sixties, Paul Weller's The Jam during the punk/new-wave era or Pulp during the Britpop years. From 1978 to 2002, Jarvis Cocker's band has gone through a lot of trends and fashions with a great songwriting talent and a very theatrical attitude. Almost unknown for more than a decade, they gain fame in the wake of bands born in the right place at the right time, like Suede, Oasis or Blur. Then follows a couple of years of media hysteria thanks to the single "Common People", a tale of the misplaced fascination of the upper classes with the working classes and a hit stuck between the end of the Thatcher era and the beginning of the Blair years. 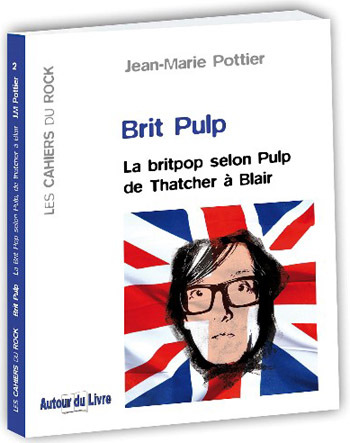 Mixing a biographical story, an historical chronicle and musical analyses, "Brit Pulp" shows artists dressed in the national flag, popstars talking to a Prime minister and a "King of Pop" humiliated in public. An exciting journey through the Britpop years! Jean-Marie Pottier is a journalist specialized in economics and politics. He has written pieces about music for a few French magazines and webzines and the music blogs Tung Songs and Interprétations Diverses. He also writes regularly in the football monthly "SoFoot", including interviews with rock bands.